I'd like to ask these ladies what made each of them take the leap of faith to forge ahead and try something new and different. Good question Jeanette...that's question #1 almost!! I'd like to know what these women were doing before. Was writing/blogging a career change or has it always been their thing? If it was a career change, how did they determine it was the right change to make? Ah, Kami, that is one of my questions too...did they always know they had a voice, did they consider themselves a Writer with a capital W? 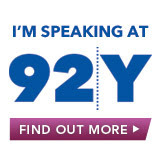 As a New Yorker, I can appreciate your love for the talks at the 92nd Street Y and your excitement to be representing BlogHer with this panel of inspiring women. I would love to know what risks and challenges they are faced with today as the publishing and media spheres are ever evolving? How do they know when to forge ahead when there are so many unknowns? Thanks! Great question Julai. It is such a rapidly evolving, dare I say volatile, industry environment now, isn't it? Hi Elisa! My question is: When forging a new path (especially as a young woman) what's more important to consider: passion, ambition, and talent or a safety net of financial stability and a back up plan? Do you keep your day job and start a "quitting fund" for your dream, or should you find a small attic apartment in NYC on Craig's List, pack a bag and let yourself shine the way you know you can? Hi Sabrina! That's such a good question. My personal take is that being wise with your money buys you freedom later when you want to try something crazy. I could just up and quit my excellent corporate job back in 2003 because I had 2 years of take-home pay in the bank and a mortgage that was reasonable, not beyond my means. But if you're young and haven't had a chance to save up that nest egg yet...what to do? I would love to know more about the women's goals for the future--how can they keep dreaming even after reaching some of their bigger goals? Looking forward to the panel! What was the tipping point where you decided you would blog as a full timer? OK, I used Random.org to generate a winner of the pair of complimentary tickets, and Helene, your number came up! I'll try to find an email on your blog to let you know. Oh, I used to live right by the Y - too bad I'm not in NY anymore. :-( I would have loved to have attended. Thank you for the information which is provided in this article is much efficient and very useful. This story is really interested. Thank you for posting. That the blogs was very excellent and more skills to development after refer that the post,in this information was very helpful in my carrier. Nice posts i regularly checking your sites and blogs. It is so helpful for me. Thank you hereafter also i am expecting more and more posts from you. Really Good blog post on worker bees blog .provided a helpful information.I hope that you will post more updates like this.